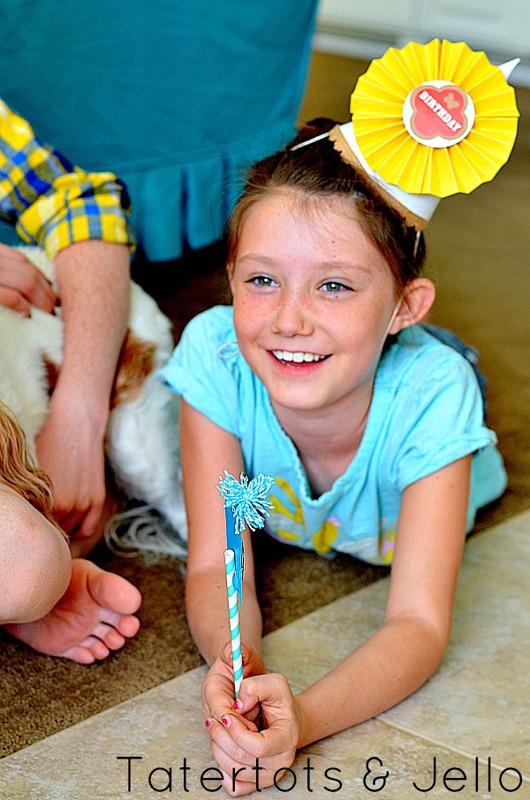 Make DIY Paper Party Hats and Party Decorations! The other day I received a box of lovely paper crafting supplies from DAVID TUTERA™ Celebrate. I couldn’t wait to get started with some projects. You might not know this, but our family puppy Trixie and I have birthdays one day apart. 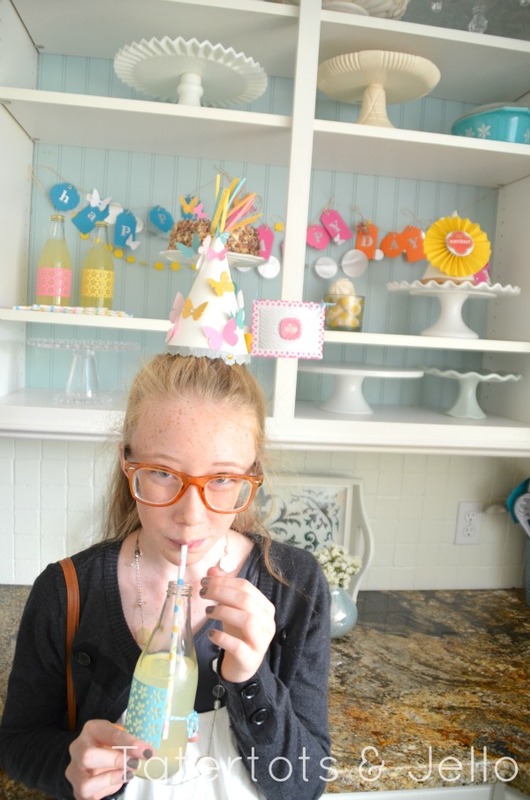 Her birthday is a much bigger event than mine — which I think is awesome. My kids start planning Trixie’s birthday weeks ahead. So when I was looking through all of the fun papers and embellishments, my girls immediately thought that we should make some party supplies for Trixie’s big day. Who am I to argue?? One of the things I love about David Tutera’s new paper crafting line is how easy it is to make cards. It only take a few minutes and three easy steps. So I thought it would be fun to apply the same steps to making party supplies using the line. And it was. 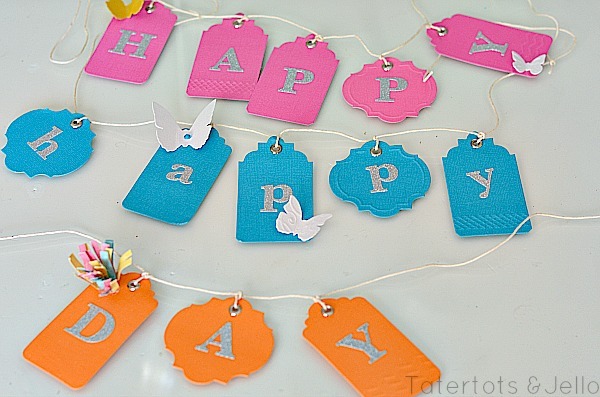 We made some birthday banners using David’s paper tags. And I might be a little obsessed with David’s die-cut butterflies. They kind of became the theme for the party. I used them to embellish the tag bunting, I also glued them onto the cake plate (using Glue Dots), AND I made a simple cake bunting with them! I love that you can make them 3-dimentional by folding them in half so they seem like they are about to fly. 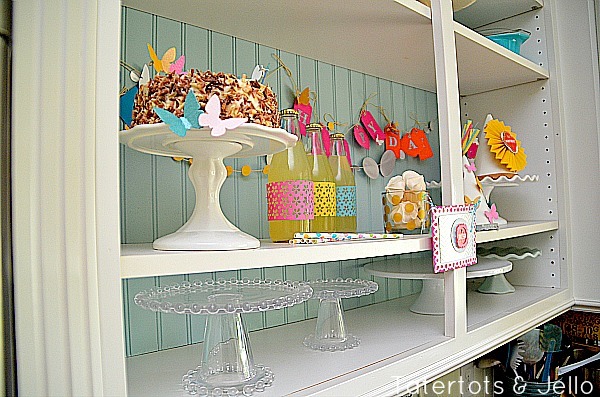 I also loved the sticky jewel embellishments that came along with the butterfly die cuts. All you have to do is peel them off of the plastic and stick them on the butterflies. So easy! 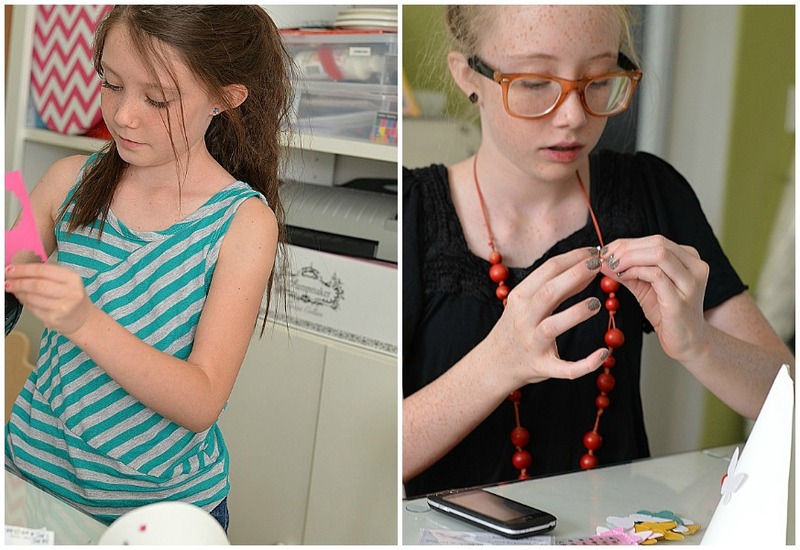 Cut a length of the twine, with a little extra at the ends so you can tie a bow at each end. Tie the twine onto two tooth picks. 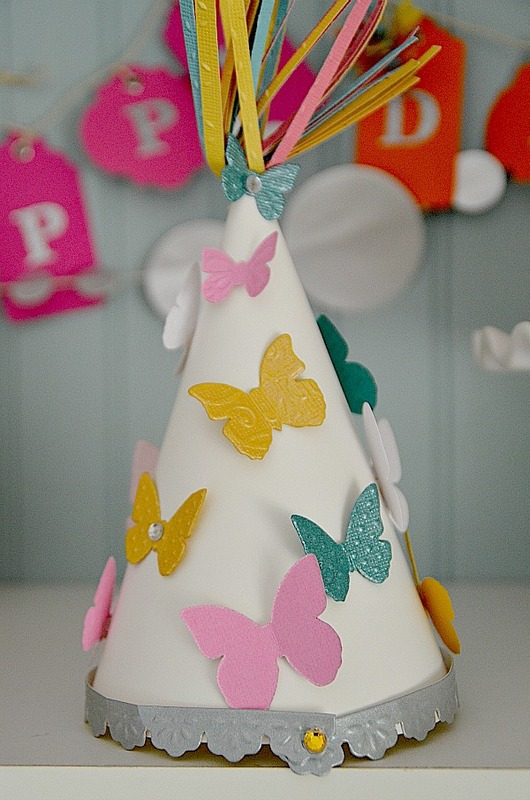 Three easy steps and you have a SIMPLE but beautiful DIY Butterfly Bunting which looks so cute on a birthday cake! 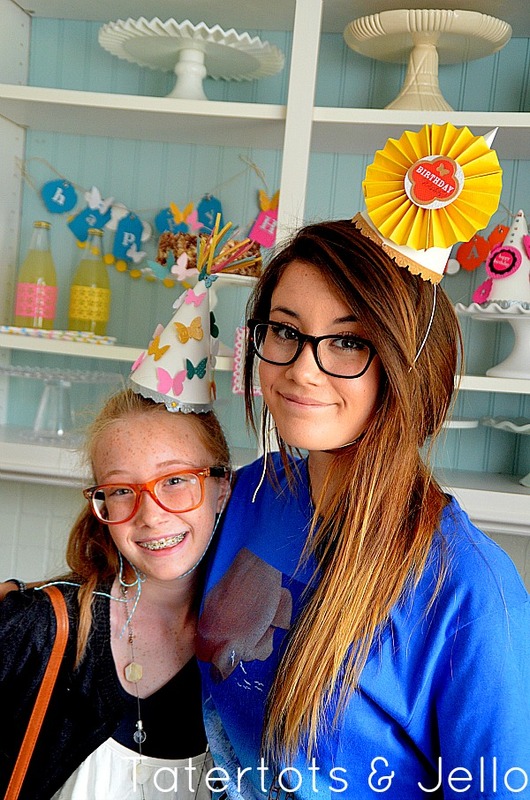 We also had a ball making DIY Birthday Hats. 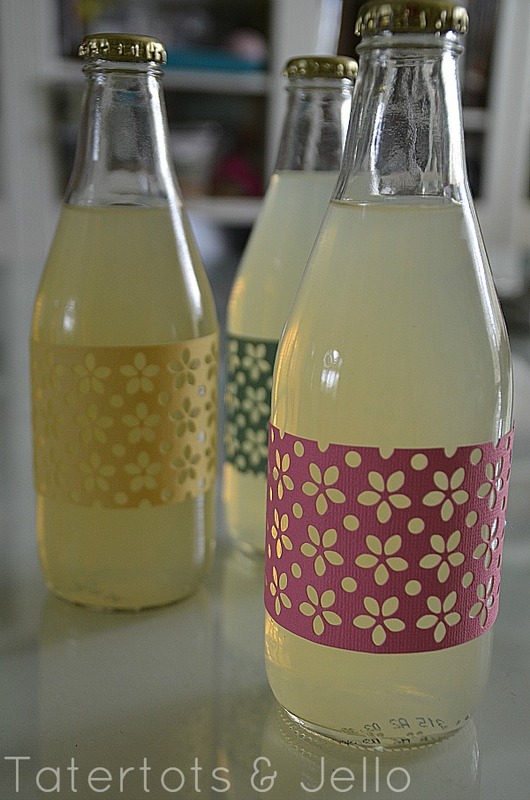 These are also very simple to make. 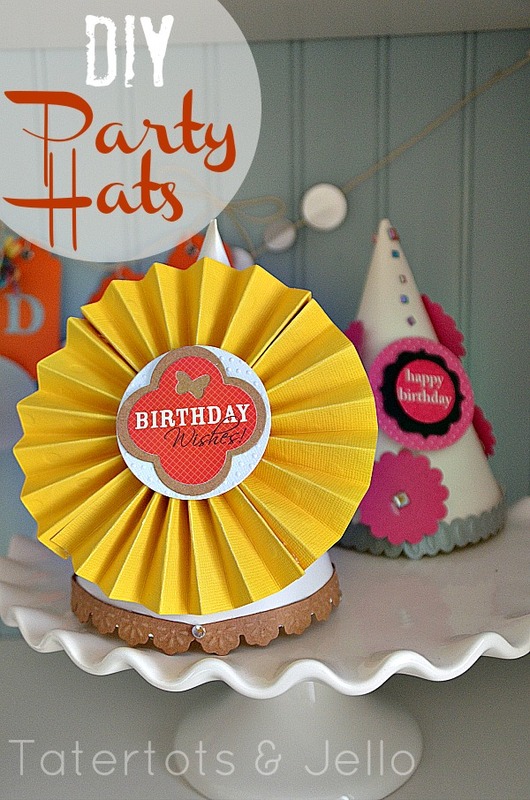 All you have to do is print out the party hat template (from Art 4 Crafts) and cut it out. 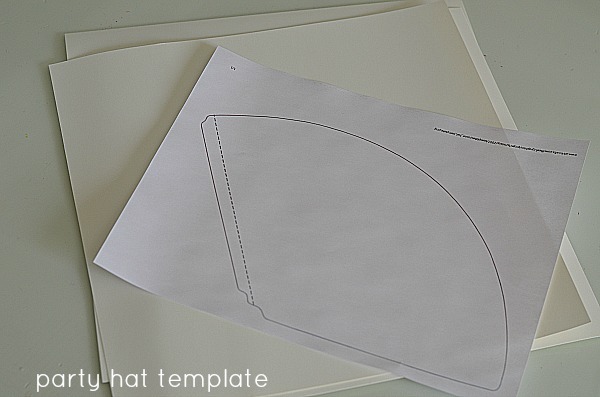 Then trace around the template on cardstock paper, cut out the shape and glue the one seam shut, creating a hat shape. Then embellish the hat. I loved using David’s pre-made birthday tags for the hats. All I had to do was peel the off of the plastic and stick them onto the party hats. So easy. The last thing to do was hot glue some strings on the inside of the hat. And here’s another simple idea. I took a sheet of David’s laser-cut paper. I cut it in half and then wrapped it around a drink bottle. I secured it in the back with a piece of baker’s twine. So easy and pretty! You can find all of these fun David Tutera supplies at Joann’s Stores in stores and online! 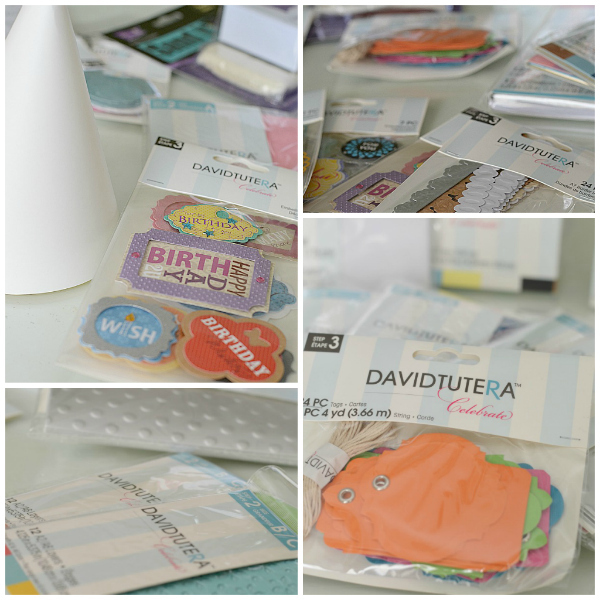 David Tutera’s Celebrate cardmaking line AND a personally signed book from David! 20 additional winners will receive a $50 Celebrate prize pack. 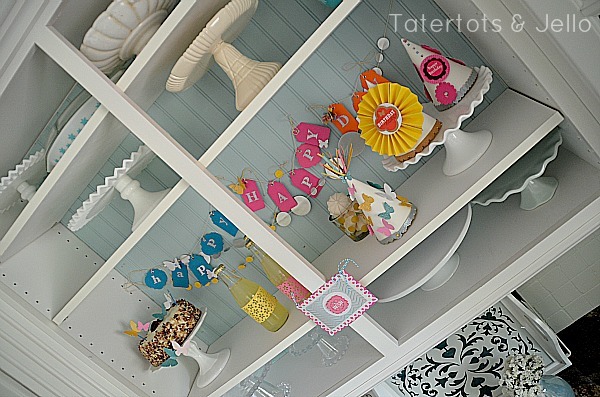 Make a Valentine Vignette with Paper Rosettes!! That puppy photo is precious! But you’re pretty cute, too, Jenn! Happy Belated– to you and Trixie! 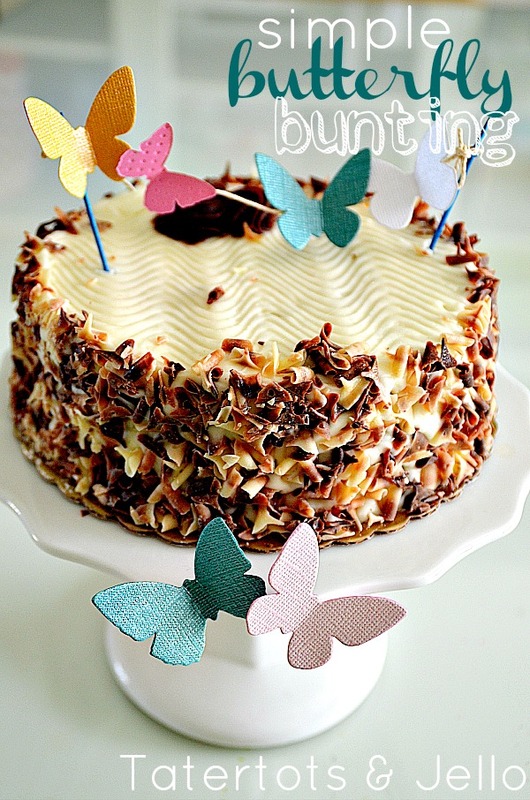 Do you have a recipe for that yummy cake? i love it all! i’m such a sucker for any paper products! the colors are so fun & festive! your (4) girls 😉 are adorable! Your dog (and family) are adorable. 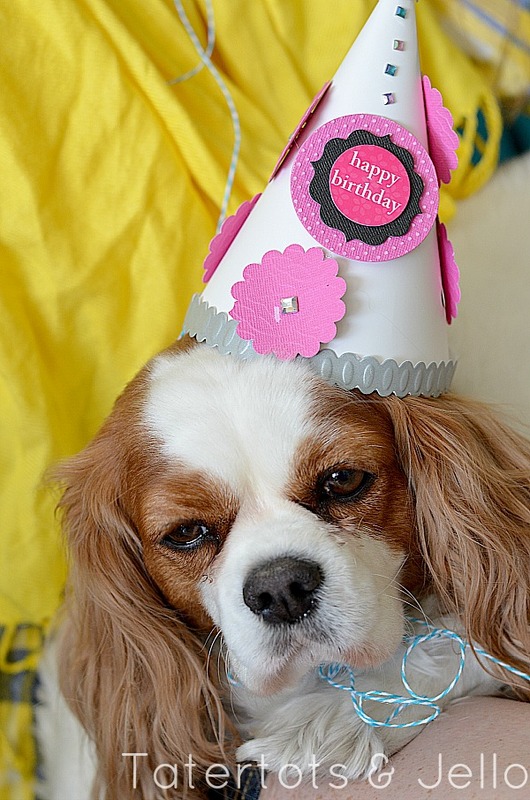 Is Trixie a King Charles Cavalier? I went to a dog show recently and fell in love with that breed. Happy birthday to both of you! 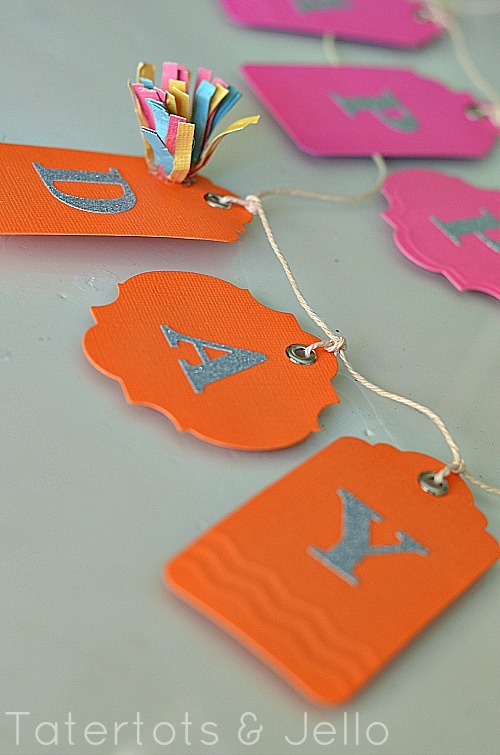 Love those paper tag banners! Definitely going to do that for the next occasion.